Finding a little girls doll houses can be difficult if it is your first time buying. Playing with dolls and dollhouses have been proven to have a positive effect on kids imagination and creativity, so getting one as a gift is always a good idea. Encourage your daughter to play with her dollhouse. Invite her friends over will engage her and help develop her social skills while playing with toys in her favorite big dollhouse. It is one of the most customizable activities you could get for your children. With the numerous types of dollhouses available you can get a toy house that will bring your daughter’s most specific wish to life. 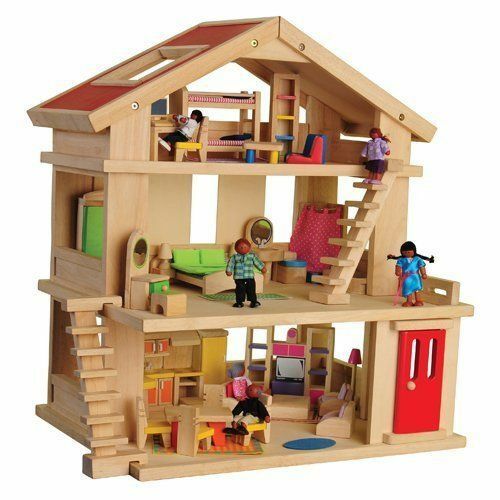 A wonderful dollhouse for toddler girls made out of safe for children and durable wood. What is great about this toy is that it includes 20 pieces of furniture, a doll family of 4 and a pet dog without any extra purchases. As you can tell from the picture, construction of the dollhouse is completely open-sided so that more than one child can play at once which makes it a perfect toy house to invite all of your children to play together. 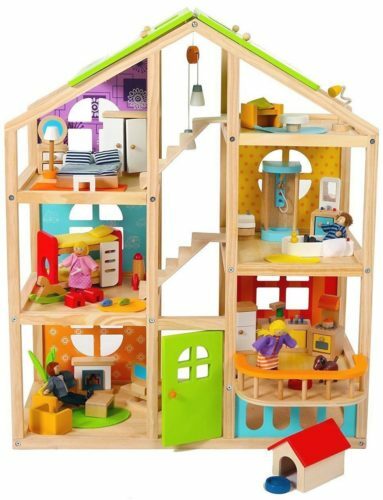 This wooden dollhouse for children could be a huge hit at your 3 year olds birthday and it is definitely the best choice for a kid that loves assembling, moving and matching different parts. 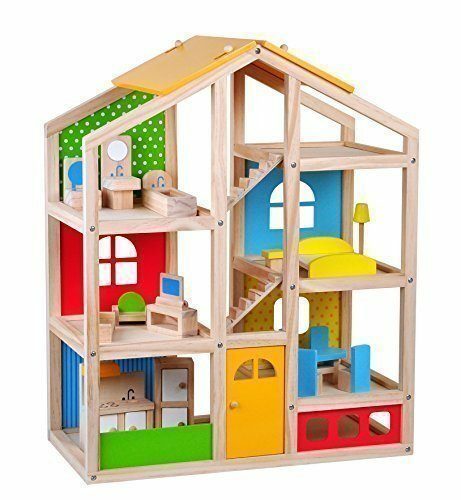 You will need to distract your toddler for 15 minutes only while your husband assembles this beautiful 23.8″ x 10.2″ x 19.3″ toy house. Pikolo Kids has created a wonderful large wooden dollhouse filled with 54 detailed furniture pieces to encourage a creative role-play and cognitive skills. This toy house is also customizable as the balcony piece can be detached and reattached to any room, together with movable staircase pieces. A very clever dollhouse craftsmanship that allows full access for more than one child at a time and the unique cut out roof design makes that even easier. Made with child safe paint and sturdy material this toy measures at 23.6″ x 11.8″ x 28.9″ inches when assembled. A wonderful choice of a birthday gift for a 4 year old girl, twins or a Christmas present for siblings. There is loads of different wooden doll furniture that goes with this doll house and the more accessories the more fun to have. A masterfully detailed wood dolls house for ages 3 years old and above that includes 54 pieces of wooden furniture that fills 5 rooms. This toy is very functional and made to play and enjoy decorating and rearranging sturdy and easy to grip wooden pieces. This small wooden dolls house will require some assembly but it will not take more than half an hour. The details are exceptional and furniture pieces include fabric cushions, rugs, bedding and even a shower curtain. In addition, your daughter will be able to play with unbreakable mirrors, lift up the toilet lid and move staircases while playing with this dollhouse that measures 24″ x 18¼ ” x 28½” after assembly. This wooden dolhouse is the best choice as a birthday or Christmas gift for a curious and playful little girl. A wonderful girly dolls houses for children aged 3 years old and above. What we like about this toy is the decorative wood finishes such as charming scalloped trim and pastel colours that will not distract your child from role-playing with dolls. All wood dollhouse frame and big sturdy furniture pieces make this toy safe to play for toddlers. These wooden dollhouses for toddlers will take you 15 minutes to build and all the tools you need is just a small head screwdriver. All dollhouse wooden pieces are pre-drilled to fit the screws immediately and line up perfectly to make assemble this toy. The dollhouse is finished with high gloss paint which will make it easy to wash off any crayon stains and maintain a germ-free environment for your girl. 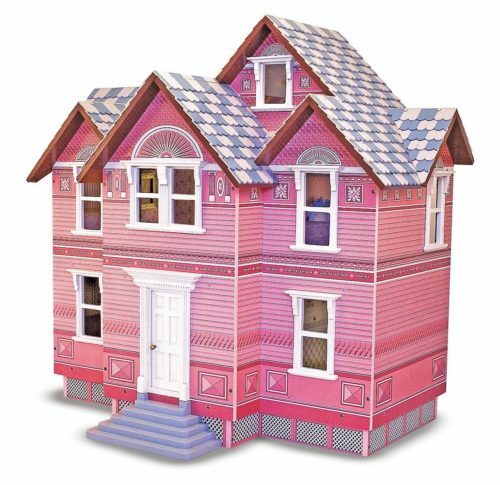 This classic Barbie bright pink three-floor dollhouse will make any little girl ecstatic. This can be a wonderful present to leave under the Christmas tree or wrapped with a big ribbon on your daughters birthday. What a fantastic way to stimulate your girl’s creativity with the endless possibilities of creating stories with dolls in a big server room dollhouse that has a working elevator, a garage, and a swimming pool! Our favorite thing about this house for dolls is the interactive “smart” accessories that when placed in the right position light up, move or make noise. There is even a possibility to insert your smartphone into the living room tv to play videos for Barbie dolls for a more realistic play time. Choose a non branded packaging for this Barbie Dreamhouse to make it a surprise gift. 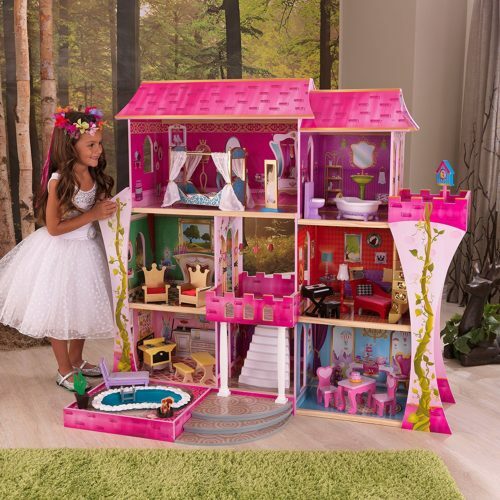 This massive fairytale castle is one of the sturdiest and safest dollhouses you can get for your little girl. Imagine the endless stories she can create during hours of play in this beautiful toy castle. All accessories and furniture pictured are included but be prepared to spend at least two hours assembling this toy for girls. The dollhouse comes to life with chandeliers that light up, a piano that plays music and a toy toilet that flushes! It is the perfect toy to fit more than one girl at a time and fits fashion dolls perfectly. 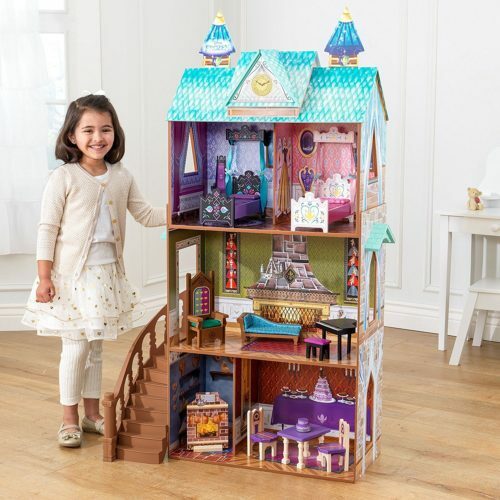 Our biggest tip is to assemble it before gifting because you don’t want to keep your little one anxiously waiting to play in this fairy tail dollhouse. A beautiful fairytale doll castle that has a beautiful attractive design for little princesses. Spacious layout allows more than one child to play at a time in many rooms of the toy castle. This dollhouse includes seven rooms filled with colorful furniture pieces, detailed outdoor pool, a balcony and a tower. The beautiful dollhouse room details will immerse your child into hours of storytelling and imaginative play. Make sure you take your time to assemble this toy house as safety is first and any neglected pieces can be potentially dangerous to your little daughter. The only con is the assembly process which will take you up to 3 hours so don’t leave it to the night before your kids birthday. Make your girls dream come true with the best Frozen themed dollhouse available on Amazon. 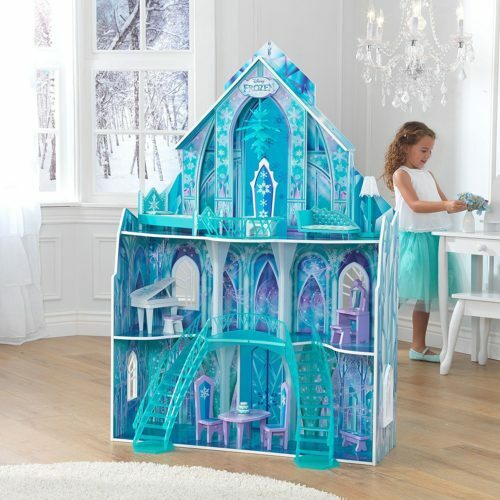 KidKraft has teamed up with Disney and made a quality dollhouse with 4 rooms and 2 big icy balconies. The dollhouse structure and furniture are made out of thick composite wood material and molded plastic. This dollhouse is huge which accommodates fashion dolls as high as 12”, includes 19 detailed furniture pieces and an adorable Olaf figurine. Did we mention the beautiful ice queen throne at the top of the Frozen castle and an ice fractal chandelier which also come with the dollhouse? Be sure to get some batteries before you get this delivered because this dollhouse comes with a light up a frozen sign and a vanity mirror that light up at the push of a button. Beautiful plastic molded staircases and a water/ice fountain make this dollhouse a realistic immersive Frozen experience for your Disney Princess. Help your little girl get lost in the world of Frozen with this realistic Arendelle Palace dollhouse where Elsa and Anna live. Such an amazing design and detail level will make your girl want to play with this toy house for hours without stopping. This dollhouse set is made from composite wood material and includes a molded plastic staircase and chandelier. Each room can fit dolls of 12” height which is the size of fashion dolls and most Frozen themed dolls. The main advantage of this fairy tale dollhouse is the easy and organized assembly as every screw is labeled and includes easy to follow illustrated instructions that is estimated to take up to 2 hours to build. We love this beautiful castle for dolls because it is not your typical pink toy made out of plastic but a uniquely designed dollhouse that will let your daughter imagine incredible stories and customize it to suit her. Your girl can now be a part of Disney’s Beauty and the Beast with this magical toy castle. It is designed to fit fashion dolls of 12” high and the mansion includes three spacious levels with charming touches such as a chandelier, masterfully detailed staircase and lots of artwork from the original kids’ movie. The full dollhouse set includes 13 pieces of Beauty and the Beast themed furnitures such as the enchanted rose, the adorable footstool dog, wardrobe with doors that open and close and a soft plastic Lumiere figurine that bends. Any Beauty and the Beast fan would be delighted to get this for her birthday or find the assembled toy under the Christmas tree. Be aware that this toy house is nearly 4 feet tall and requires quite a lot of room to play around, especially if multiple children will be playing with it. A classic kidkraft barbie house with all of the best quality accessories and decorations any girl would love. Nothing can replace the unique design of Barbie timeless fashion dolls and their houses. What we love about this toy maker is that they are not stuck in time but evolving and improving their products. 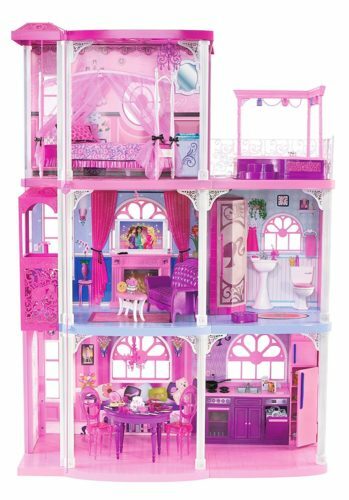 This smart dollhouse features incredible interactive technology such as the beautiful elaborate hot pink elevator and a pop up flat screen TV. Your child will also be entertained by the doorbell, kitchen timer, fun shower singing and even a silly flushing toilet sounds. This Barbie townhouse comes with high quality house pieces, stickers and 55 furniture pieces and accessories for your girl to enjoy playing for hours. You will be pleased to know that it is easy to assemble but does require patience because of some small intricate details and making sure the stickers are even and well placed. 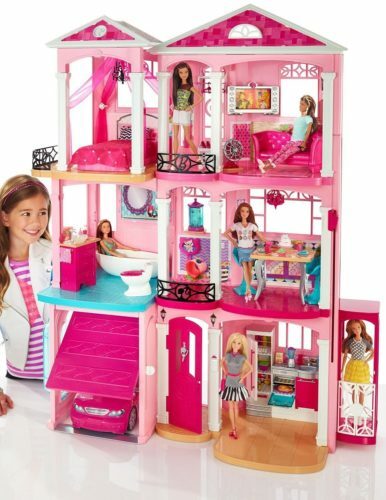 If your daughter loves playing with fashion doll this dollhouse is a must and we guarantee it is worth every penny. 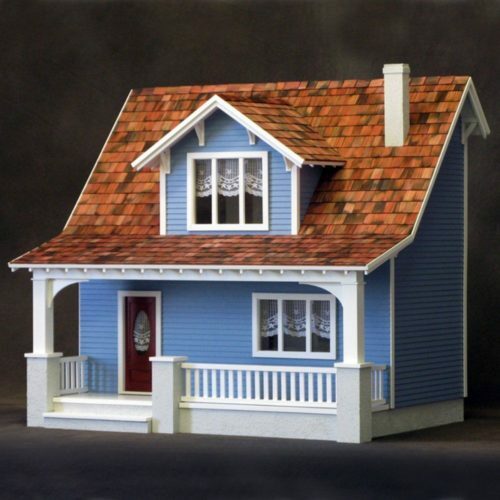 A masterfully detailed dollhouse that will be an amazing design project for your girl. If your daughter is slightly older but loves making clothes and living spaces for dolls this is the best gift for her. What is unique about this dollhouse is that it looks like a realistic replica of a quaint Victorian house. Features of the dollhouse include high quality exterior details such as ornate window frames, patterned friezes and gables and elegant staircases. Dollhouse interior features colored wall graphics unique to each room. This handmade wooden house for dolls will require quite a bit of work to assemble but we advise to see this as an opportunity to have a father-daughter activity. You will be delighted to know that all hardware and clear step by step assembly instructions are included with this dollhouse. The only drawback is that this dollhouse does not include Victorian furniture, however, it is available to buy as a separate set. This quaint beachside bungalow is one of the highest rated dollhouses on Amazon. Be aware that this dollhouse will require to be built and painted following detailed instructions. It is a unique opportunity to teach your soon to be teenage girl how to be patient by helping you assemble a dollhouse. Before you get started to make sure you have all the tools and equipment such as paint, sandpaper, hot glue, tape measure, ruler and other tools by your side to make the dollhouse building process easier. If your daughter loves arts and crafts this toy house kit will definitely keep her occupied and she will be able to feel accomplished and proud of her doll house with the finished result. 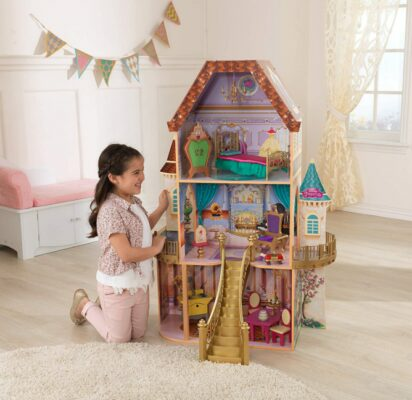 This dollhouse is a definite favorite that will make your daughter the happiest little girl. Disney Frozen Arendelle palace is a definite best seller and made out of the best quality materials that will give you more than you pay for. We recommend this beautiful dollhouse kids pick because it will let your daughter play in a realistic Frozen castle that will stimulate her imagination. This Barbie Dreamhouse is the best choice of the dollhouse to get as much as you can for your money. 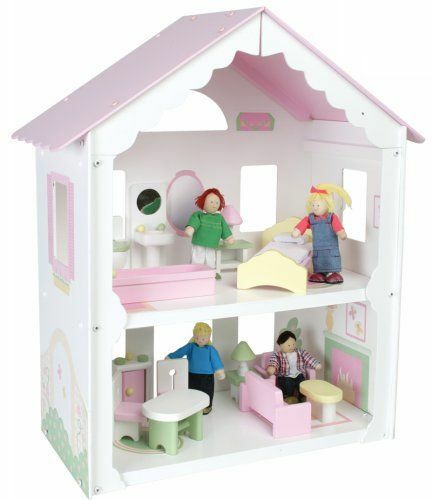 We would recommend this doll house for any little girl as the beautiful pink design will put a big smile on any child. There is a vast selection childrens doll house and accessories. You can choose a colorful array of different sized houses depending on the doll and child height. There is a big demand for fantasy character-themed dollhouses such as Frozen, Cinderella or almost any other animated movie character. A popular kids doll houses choice is expandable dollhouses. This involves getting a generic dollhouse shape and getting add-on expansions to grow a custom house when your girl gets more dolls or outgrows the current size dollhouse. If you are considering getting a truly long-lasting dollhouse for your girl – luxury dollhouses would be the best for you. These types of dollhouses usually look like big Victorian mansions and are made from the best quality materials. 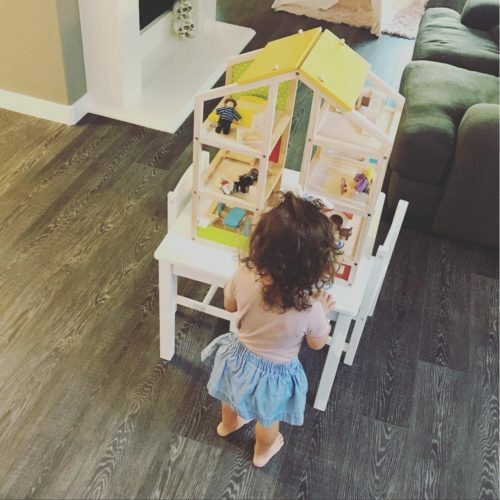 A dollhouse is truly a once in a lifetime purchase and you will be able to pass this on from generation to generation of very happy girls with very happy dolls. The main safety feature you need to consider is the chemical composition of materials of a dollhouse. Your child will be playing with this toy for many hours at a time, therefore, make sure she is not touching any toxic materials. Look for non-toxic paints and finishes on the furniture and the dollhouse itself. These toddler dollhouses have been developed concerning safe materials for children to play with and most kids toy companies have stopped using lead based paints. If the dollhouse you are getting is made of plastic, then make sure it does not have any BPA added. BPA has been proven to cause cancer and respiratory issues therefore you need to eliminate this from your child’s play time. Make sure there are no loose parts that can cause the toy house structure to collapse. If it is made out of wooden material make sure there are no splinter risks as your daughter will not enjoy playing with the house if it causes her pain. Dollhouses come in a range of standard sizes that are expressed as a scale ratio, fore example 1:6, 1:12, 1:16 and 1:48. The most widely available dollhouse scale is 1:12 also known as one-inch scale, where doorways will be 6 – 7 inches tall or larger, which will fit almost any regular 5 to 6 inch doll. A slightly different scale is 1:6 which allows dollhouse to fit common dolls such as Barbie or collectible fantasy figures as a standard doorway would be around 15 inches in a dollhouse and can fit any doll up to that height. The actual full size of a doll house will always be stated in the manufacturer’s guidelines to help you match the best fit toy house to your children’s needs. It is very important to create a germ-free environment when your children are playing with a dollhouse. These types of toy houses contain a lot of small furniture pieces and small corners for dust and bacteria to gather. Keep in mind that owning a big doll house with requiring regular upkeep checks and cleanups. See this as an opportunity to introduce your little girl to the importance of cleaning up and make it a joint mother-daughter or father-daughter activity to check every week or two for any dirt that can potentially be dangerous to your child’s health. If you are buying a dollhouse for your girl it is guaranteed that you will need to assemble it once it arrives to your door in a box. An average big multi-story dollhouse will take you from 1.5 to 3 hours to build. Do not get discourages as it is the perfect activity to bond with your little girl and teach how to assemble items. Typically under the age of 3 is too young to play with a children’s doll house because there might be too many small pieces that the child can choke on if not careful. However, if the toy house has large items and made completely toddler proof then you can definitely consider getting it. Always make sure to check the manufacturers recommended age range for a specific doll house you are considering to buy your child. The best choice for girls a little older than toddler age is dollhouses that are made out of big intricate shapes and have integrated games that require them to match shapes or construct the house and rooms. This is an important age to stimulate your child’s development, encourage curiosity, exploration, and imagination through as much creative play as possible. The best toy for a developing child would be big wooden customizable classic dollhouses that come with large parts and all the furniture pieces are made out of one piece for safe play. Girls over the age of 7 years old might want a large wooden doll house. Be prepared that at this age they will be wishing for barbie and princess dolls and they will need beautiful big doll castles to house them. Children 8 years old and above will have their own likes, dislikes and opinions so it is important to communicate with them and ask what kind of doll house they would like. Don’t be surprised if your daughter will ask you for a lot of animated kids movie merchandise as this is the age you will be able to take them to the cinema and finally watch that Frozen DVD. The biggest tips would be to make sure you listen what your little girl likes and wants and try to make her biggest dollhouse dream come true. Ages 7 to 9 years old are the best for throwing big birthday parties so make sure and have a big box with a beautiful fairytale dollhouse wrapped inside for your princes. Middle School age is when girls start focusing more on social activities like going out with friends to the mall rather than playing with child’s dolls house. However, your 13 year old girl might be interested in making outfits and hairstyles for the dolls and that is really important to recognize and encourage the creativity. If you are looking to get a dollhouse for a middle school age girl then it would be beneficial to look into a more sophisticated and collector’s item dollhouse. A beautiful luxurious well maintained dollhouse will be a decoration piece even when your child has outgrown the age of playing with dolls. KidKraft are one of the worlds best affordable kids furniture toy makers that have been around for 50 years. If you are looking to get a beautiful design dollhouse that is of the best quality and can be found almost anywhere in the world – KidKraft is your best choice. This toy furniture company makes the biggest variety of girly dollhouses that can be of any size and material. This is the ultimate dollhouse brand as you can get toy houses for girls of any age. Barbie is a timeless toy company that prides on their Barbie Dreamhouses. It is one of the more expensive toy makers and their dollhouses do come at a higher price, however because it is such a big franchise that has been making dreamhouses since 1962 you will get the best quality product. Another advantage is that Barbie dolls wooden house almost always include furniture and you d not need to spend extra money on accessories. In addition, the beautiful pink palaces are worth the money and it is a given that your daughter will love it. Disney is the best-known franchise in the world and they do make the best doll fantasy castles based on their animated movies. Disney toymakers are known for the best quality and original designs that always attract the attention of children and keep them playing for hours. Keep in mind that if you buy a Disney item you will be getting an authentic product with a “stamp of approval”.